Hi, I am interested in your 1995 Jaguar XJS V6 Convertible (stock #CTP2439) listed on Autotrader for $13,900. I'd like to get more information about this vehicle and confirm its availability. 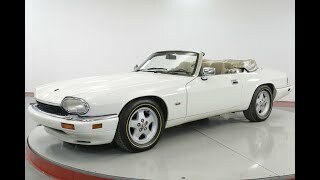 Worldwide Vintage Autos is pleased to present this 1995 Jaguar XJS. The Jaguar XJ-S (later XJS) is a front engine rear-wheel drive 2+2 luxury grand tourer. It was manufactured and marketed by Jaguar from 1975 to 1996, in coup, fixed-profile and full convertible body styles. There were three distinct iterations, with a final production total of 115,413 over 20 years and seven months. Originally developed using the platform of the then current XJ saloon, the XJ-S was noted for its prominent rear flying buttresses. The styling was by Jaguars pioneering aerodynamicist Malcolm Sayer one of the first designers to apply advanced aero principles to cars and who died just before the XJ-S body styling was frozen for production.